Ten years ago last month Lancashire Walks website was established with the aim of describing a walk for each week of the year. Since then the website has described almost 500 walks – though it has to be stated not all in Lancashire. This lovely walk was the first route we posted. Start: Cinderbarrow Picnic Site is just off the A6 on Tarn Lane, on the right going north, 2 miles north of junction 35 of the M6. Character: Mainly easy with one sharp ascent to ridge above Leighton Hall. Towpath, fields and woodland walking. Road walking along A6. From picnic car park turn left onto Tarn Lane and continue across railway bridge to canal bridge. Access canal by gate on right. Turn left and walk beneath the bridge, along one of the northern reaches of the Lancaster Canal. Pass under the next bridge and look for metal gate a short distance beyond. Go through, turning right taking track as it crosses the railway and winds down to lane. At lane, turn right, walk through hamlet of Hilderstone. About 150 yards along look for bridleway on left. Turn into this lane, flanked by hedgerows and follow it for 15 minutes to where it brings you onto the A6, opposite Hazelgrove Lodge. almost obscured by nettles. Cross stile and walk with hedge on left. At end of field pass through wooden gate and immediately turn right through another, onto a track that follows the edge of White Moss. Beyond a pair of gates, the way meets a substantial track to bring you past a small holding. Continue forward, through two more gates. At the point where the track turns to the right, take small gate into a pasture that rises gently to another gate. 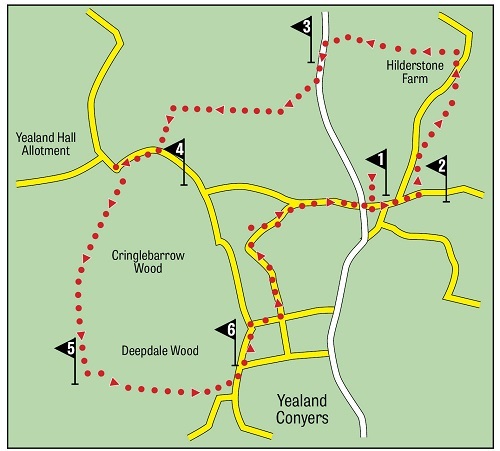 Through this, take the path to the corner of field that brings you onto a lane close by the Yealand Storrs sign. Leighton Hall, approaching Home Farm through a pasture. leading up to the ridge. At the top of the ridge there is a trio of benches, inviting pause, and no wonder, for looking back must be one of the loveliest views in England. Continue straight through trees, reaching a stone wall. Enter a field by a kissing gate. Continue forward keeping to the left of a limestone outcrop. The path, less obvious until this point, descends through woods to a fork. Right leads to a lane, left takes you across parkland - both bring you to Yealand Conyers. On reaching its main street turn left. then follow with hedge on your left to the next corner to a wooden stile. Cross the next field to the end of Well Lane, on the edge of Yealand Redmayne. Turn towards the village but immediately turn right along a bridleway. Follow this track as it zigzags to Nineteen Acre Lane. Turn right on to lane. Soon you come to the A6 in sight of Cinderbarrow Picnic area.